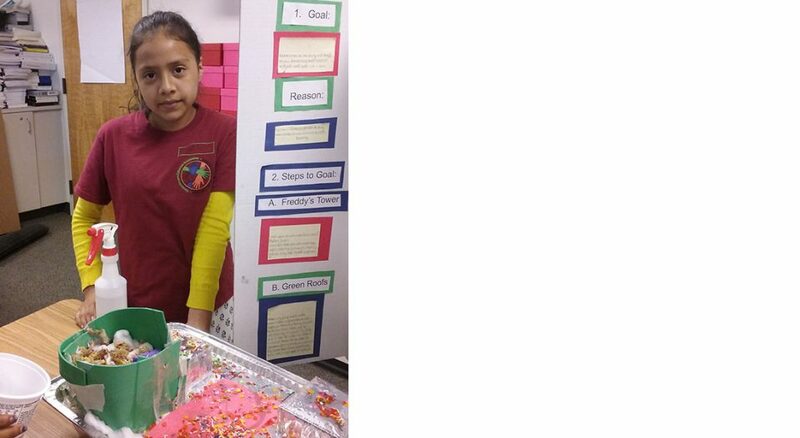 A young camper shows off a science project from Summer Academy 2016. Cesar’s model town was designed to keep oil, grease and other toxins from polluting the local river. Sponges, cotton balls and other absorbent materials dotted the cardboard-and-aluminum foil town, built on an aluminum turkey pan. Squirting his creation with a spray bottle, Cesar showed how his “green” roofs absorbed rainwater so that very little reached the “river” at the bottom of the pan. His project was part of a unique summer program created by regional Lutheran and Episcopalian congregations and local civic institutions working together in Mount Vernon, Wash.
Summer Academy 2016 targeted Latino children, especially those whose parents work in agriculture in surrounding Skagit County. While nearly 50 percent of the students in Mount Vernon public school are Latino, only about 20 percent graduate from high school. “We want to change that,” said Emilio Benitez, pastor of El Camino de Emaus Lutheran Church. Benitez started a two-week summer camp in 2012 while he was serving a Spanish-speaking Episcopalian congregation. When it became part of the ministry of El Camino de Emaus in 2015, the vision for the camp began to grow. Supporters created the Foundation for Academic Excellence (FAE), a nonprofit organization whose board members come from Episcopalian and Lutheran congregations. From their base at El Camino and its host congregation, Burlington Lutheran, Benitez and other members began reaching out to parents and school districts. What did students and families need? How could the foundation best support student success? How could church members participate? The program was shaped as answers rolled in—especially when the Mount Vernon school district explained that it could serve only 500 of the nearly 3,000 children who needed summer school to reduce the gap between them and their peers. Benitez and FAE board members reached across denominational and civic lines to build the program. Staff from Catholic Social Services joined FAE in recruiting families and financed the cost of Latino college interns. Skagit Valley College offered space for classrooms and bilingual education students to serve as interns and assistant teachers. The school districts of Mount Vernon and Burlington offered transportation. So did Family Promise, a church-based homeless assistance organization with many ELCA partners. Camano Lutheran donated their van to transport Latino students from Stanwood. Congregations offered volunteers and financial support. A grant helped pay certified teachers and the bilingual interns. FAE aimed to register 100 students. Nearly 200 enrolled. Tuition—a low $15 per student or $30 per family of two or more children—included breakfast, lunch, transportation, T-shirts and field trips for children ages 4 to 14. Each four-hour day included music, literacy and STEM (science, technology, engineering and math) projects like the model green towns. Even gym class stressed literacy, weaving vocabulary words into games like hopscotch.